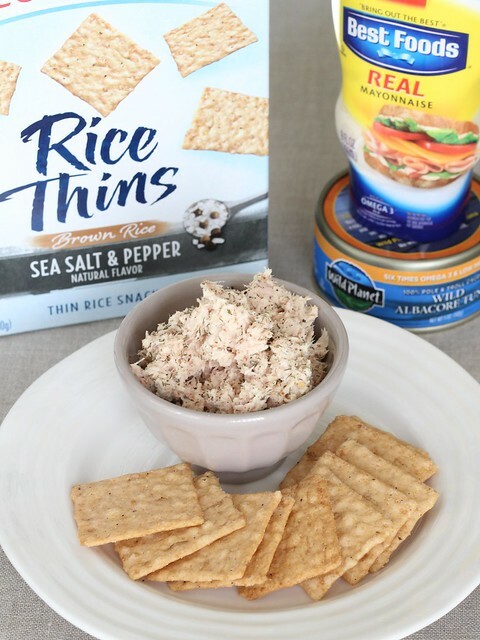 Grown Up and Gluten-free "Tuna Snacks"
As a kid, one of the go-to lunches for this [former] sandwich hater was a pre-packaged tuna and crackers kit. Avoiding gluten meant bidding farewell to the grab-and-go “tuna snacks” — as my family often called them — but it opened up a world of better-tasting and more sustainably caught canned tuna and an ever-expanding cracker variety (what’s up with the measly six crackers or so in the kits anyway?). I’ve never been one to doctor up my tuna beyond a squirt of mayo and sprinkle of celery salt and pepper; strangely enough I never saw the appeal of adding relish or chopped pickles, and I’ve loved pickles ever since I was a toddler. ANYWAY, I recently stumbled upon a shaker of Savory Spice Shop’s Cherry Creek Seafood Seasoning in my parent’s pantry and fell in love. Its prominent dill flavor, plus a host of others, really perks up the fish — it’s hard to describe, but it just tastes more grown up to me. As for the crackers, one of my new favorites is from the Nabisco Rice Thins line. I highly recommend giving the brown rice with sea salt and pepper variety a try — they hold up well to scooping tuna or garlic and herb cheese dip, and contribute a nice amount flavor to the mix. Original was a little too much like a standard rice cracker for my taste (read: bland, slick texture on the outside) … though with a wedge of triple creme cheese I could be swayed, I’m sure! I’ve found them at Stew Leonard’s in Connecticut, and at grocery stores (Safeway and Lucky) and Target in the Bay Area, so I’m guessing they’re one of the easier-to-find and well-priced gluten-free cracker options nationally. What’s your go-to gluten-free lunch on the go? Any favorite gluten-free cracker brands you’d like to share? Let’s talk in the comments or on Facebook or Twitter! Flake tuna into a small bowl. Add mayo and seasoning blend, adding more or less to taste. Serve with crackers. ¹ Available at Whole Foods, Target and in multipacks at Costco.